A significant percentage of the world population are non-vegans. Although being non-vegan can be useful from the nutritive point of the diet in some regards, there are also crucial health concerns for the non-vegan population. The major component of the diet of the non-vegans includes meat based foods as a result of which the demand for such foods has increased tremendously. This has influenced the developmental procedures that are involved in the meat based industry. However, the industry faces stiff challenge from the negative impact of the consumer concerns. Some of the concerns include use of additives, spicy nature of the products and the presence of high fat. The introduction of probiotics to such food products like sausages could promote benefits of health in the hosts due to the release of compounds like lactic acid. One of the ways that can further enhance the potential of probiotics through them is the application of the beneficial bacteria to ferment raw meat as in salami. This would save the probiotic bacteria from getting killed during the heating for the preparation of cooked meat. There are other technological challenges associated with the introduction of probiotics in fermented meat products. The question of probiotic sensitivity to spices, salts and other ingredients involved with the specific formulations is not beyond doubt. In addition, even if the bacteria survive these conditions they have to overcome the prevalent conditions during their passage through the stomach in minimal numbers that is required to render their beneficial effects. Moreover, the appropriate application of probiotic strains is a prerequisite under specific conditions. The probiotic bacterial strains should have in possession certain desirable qualities so that they can be applied in meat products that are produced through their fermentative action. The bacteria must be viable through a wide range of adverse conditions that are presented during the processing of meat products. Some of the conditions that are prevalent are high content of nitrite, decreased water activity, high salt and low pH. In addition, the growth rate of the bacterial strains should not be compromised during the manufacturing process, easily cultivable on a large scale, possess higher shelf-life and have resistance against lyophilization procedures. There can also be differences in the activity of the probiotic strains according to the form in which they are added to the food product during the processing. The addition of the probiotics as liquid inoculum is much more effective as compared to their application as lyophilized or encapsulated forms. The pathogenic bacteria prove to be the reasons of considerable menace in the meat products. The probiotic strains in fermented meat products have been reportedly found to be able to release bacteriocins or the inhibitory molecules to prevent the growth of the pathogens like Listeria monocytogenes. The use of bacteriocin mediated control of the infectious agents can be beneficial from the health aspects as they pose no threat of toxicity. The probiotic bacterial strains can allow a natural mode of preservation of the food products. A number of beneficial strains like L. brevi, L. plantarum, L. casei, L. sakei and L. curvatus have been demonstrated to be potent bacteriocin producers in meat. The naturally occurring microorganisms can produce amines by the decarboxylation of the amino acids present in the meat and meat related food products. The release of amines like tryptamine, spermidine, histamine and tyramine in the food products possess potential toxic threat to the consumers particularly who are deficient in amino oxidase and hence the biogenic amines so produced cannot be detoxified. In general, such microorganisms thrive from the availability of high content of protein and their proteolytic activities. Therefore, one of the selection criteria for the use of probiotics in fermented meat products should be the ability to inhibit the growth of these natural inhabitants of meat. This would ultimately prevent the release of the toxic biogenic amines. L. acidophilus and L. casei strains have recently been found by Ergonal et al. to cause reduced levels of amines like histamine and putrescine in fermented meat products. Jahries et al., carried out an effective study to observe the health benefits of the meat products with probiotic content. It was found that the daily intake of salami with L. paracasei probiotic presence produced satisfactory level of improvements when checked for cholesterol, triglycerides and the immune responses of the recipients. The introduction of L. plantarum has been reported for their ability to enhance cytokines like CD4 and CD8. Others have reported that the probiotic strains of L. pentosus, L. Plantarum and Pediococcus pentosaceus could adhere to and colonize the human gut when taken through fermented meat products thereby lowering down the incidence of pathogenic attack after the consumption of such foods. 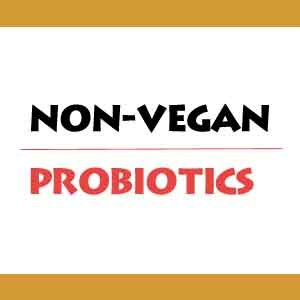 The use of probiotic bacteria in the fermentation of non-vegan food products have resulted in significant beneficial effects on the host health. They have been involved in rendering protective as well as preservative actions to the products. Therefore, the intake of probiotic bacteria through the meat products can improve the overall quality of the foods as well as their shelf life.